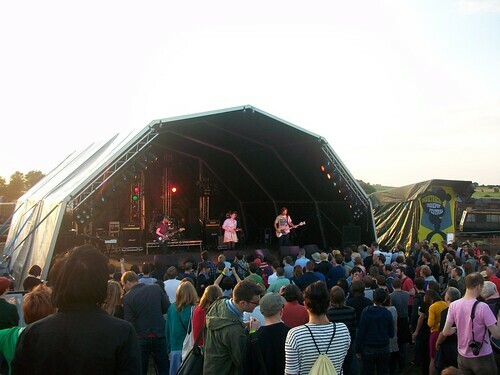 Indietracks - an indiepop festival: Indietracks reviews! We've been keeping an eye on all you busy bees writing for fanzines, blogs and magazines, and have rounded up a selection of our favourite Indietracks reviews for you to check out. We've picked out some of our fave quotes and provided links to the full reviews where possible. We know there's still more reviews and podcasts to be posted, so we'll keep updating this as the coverage is put online. Happy reading! "Now in its fourth year Indietracks is indie-pop’s mecca, its Nirvana – a festival borne from all things C86 it is the place to be for indie music with heart." "With its tiny capacity and eccentric setting, Indietracks is a one-of-a-kind festival where you can spend as much time hanging out with bands as watching them perform." "It is difficult to pinpoint one single thing that made the Indietracks Festival such tremendous fun....Derbyshire should be very proud of its own, little-known, but ever-expanding festival. Roll on next year." "Drawing on the same wellspring of C86 pop that fuels most of the bands and all of the fans at the festival, The Pains of Being Pure at Heart take down that wall between performers and fans, summing up the sense of common purpose and shared belief you feel everywhere you walk around this weekend." "Set in the glorious countryside of rural Derbyshire, Indietracks is a unique festival that showcases the best of new and upcoming indie music talent.....Indietracks is that rarity of a festival, a trailblazer that is something different and isn’t afraid to come out of the box." "[POBPAH’s] set is the perfect send-off, and as the last steam trains leave the site and the last cries of "We will never die" echo out into nothingness, they confirm unequivocally both their status as one of the planets most exciting bands and the weekend’s status as one of the friendliest, most enjoyable, nay best, independent festivals." "Indietracks is such a perfect festival that I almost want to keep it a secret. But as the profits go to keeping the wonderful Midland Railway Centre running, I guess I ought to start forcing everyone I know to come and join in the indie fun." "It's so hard to write succinctly about Indietracks when it's so much that makes it special, the bands, the venue, the fantastic food, the organisers and volunteers who do such a great job and the trains. But, and it's a cliche, I guess what really makes the festival each year is the people...It's a moment where turning around to see someone dancing behind you can lift your heart 'til you're feeling giddy or someone you haven't seen in forever gives you a hug, and suddenly you remember that, yes, this is what Indietracks is all about. Roll on next year." "There are trains to drink on, indie discos to dance at, new friends to meet ... Indietracks is like being a member of the best social club you'll ever find. And yes, there are badges. "The location is stunning, the campsite clean, and the festival-goers (on the whole) loved-up and well-behaved. And where else can you see your favourite band members looking rough in the shower queue, mere hours before they go onstage?" "Indietracks 2010 proved to be the most successful Indietracks festival to date, and by successfully drawing together the older generation of indie bands with more recently established acts and truly up and coming groups, it has reaffirmed its status as one of, if not the best of the UK’s smaller festivals." We'll be adding to this list over the next few weeks, so please drop us a line if we've missed anything interesting! Please help the Midland Railway!